Pressure cook the potato, peel the skin and mash. You can add green peas, carrot etc also for filling but the quantities of chillies and salt need to be adjusted accordingly. Similarly you can add garlic and fennel seeds if you prefer. Cut all the vegetables and ginger. Sautee mustard and when it splutters add the vegetables and sauté well for 5 minutes. Then add the mashed potato, turmeric powder, salt and sugar and sauté for another 2 minutes. Add the chopped coriander leaves and turn for a second and remove from fire. Cut the bread slices into two triangles and spread the prepared filling on top of one piece and cover it with the matching piece. Then heat the griddle or toaster and toast with ghI or oil or without this. You must roast both sides for crispness and serve hot. Though this blog contains mainly the south Indian dishes, occasionally I may tell you also some good preparations I had come across in the other parts of the country and tried. Today, I am going to tell you how I made a special dish famous in Nagpur that my in laws praised very much. Mix all the ingredients shown for covering together except the oil and pour over this hot oil and mix well. Add water a very little as to make a dough as we do for chapAtti. Keep aside. Take lemon size of tamarind and add 4 to 5 tablespoonful of water to make thick extract. Add to this extract raw oil and garam maSAlA powder with sugar. Mix well and make a paste. Keep aside. Take 4 green chillies, grated coconut, roasted poppy seeds, garlic cloves and fennel seeds and grind into a coarse paste. Sautee this well in oil, adding red chilli powder and sugar for 5 minutes. 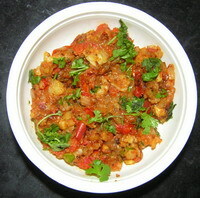 Remove from fire and add chopped coriander leaves, lemon juice with salt and mix well. Keep aside. Now from the dough, take a small portion, roll into a circular shape like a small chapAtti, which should be of medium thickness. Apply the prepared paste uniformly all over leaving a little space at the edge. Take two tbs of the filling and place at the centre and roll the circle by hand with the filling gently and apply a little water and paste the edges on all sides. Fry in hot oil simmering the flame as to fry the puDachi vaDi into golden colour. Fry all sides and remove. 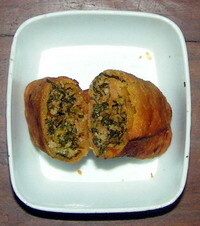 Serve hot either completely or cut into halves if the rolled vaDi is longer. This entry was posted on June 4, 2011 at 11:55 pm and is filed under Miscellaneous Snacks with tags bakar vadi, Bengal gram dal flour, besan, bread, chopped coriander leaves, fennel seeds, garam masala powder, ginger, green chillies, lemon juice, maida, onion, poppy seeds, potato, pudachi vadi, Pudachivadi, red chilli powder, refined oil, roast, salt, sandwich, slices, sugar, tamarind extract, tomato, turmeric powder. You can follow any responses to this entry through the RSS 2.0 feed. Both comments and pings are currently closed.